"Pick a good model and stay with it," Henry Ford once said. No, he was not talking about cars; he was talking about marriage. Was Clara Bryant Ford a "good model"? Her husband of fifty-nine years seems to have thought so. He called her "The Believer," and indeed Clara's unwavering support of Henry's pursuits and her patient tolerance of the quirks and obsessions that accompanied her husband's genius made it possible for him to change the world. In telling the story of Clara Ford, author Ford Bryan also charts the course of the growing automobile industry and the life of the enigmatic man at its helm. But the book's heart is Clara herself—daughter, sister, wife, mother, and grandmother; cook, gardener, and dancer; modest philanthropist and quiet role model. Clara is newly revealed in accounts and documents gleaned from personal papers, oral histories, and archival material never made public until now. These include receipts and recipes, diaries and genealogies, and 175 photographs. Ford Bryan, who lives in Dearborn, Michigan, has written five books about Henry Ford, including The Fords of Dearborn, Henry’s Lieutenants, Beyond the Model T, and Henry’s Attic. 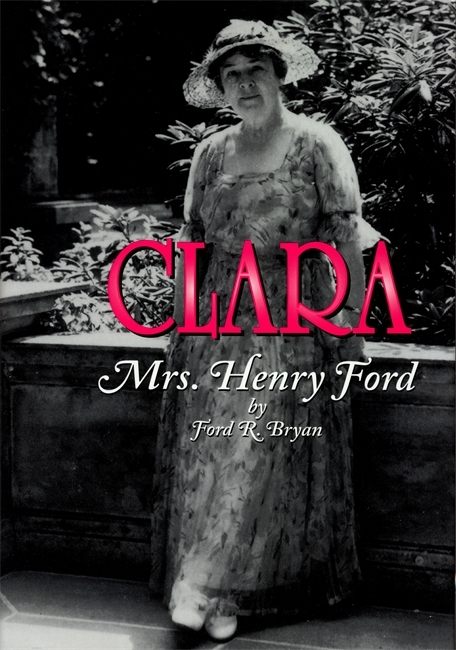 Clara: Mrs. Henry Ford comes from the pen of historians Ford R. Bryan who presents us with a meticulously researched account of the brilliant woman behind the quirky genius." Behind every successful man is a woman' the old saying goes, and that certainly was true with my great-grandfather and his remarkable wife Clara. Yet because Clara chose to fulfill a traditional supportive role, little has been written about her. Ford Bryan has filled this historical void. Ford is well known to our family as an outstanding historian, and, once again, he has produced a meticulously crafted account. – Edsel B. Ford II, is the great-grandson of Henry Ford and the son of Henry Ford II.